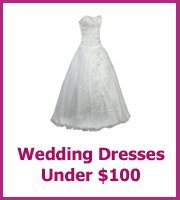 A backyard wedding reception is one of the coolest cheap wedding venues there is and very popular now. If you have a big backyard or you have a relative or friend who is willing to lend you their backyard for your wedding reception, great! A backyard wedding can take on the form of either formal or informal. 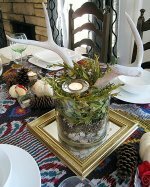 The ambiance will depend on the set-up, decorations and type of dinner presentation. It is up to you which way you want go but note that holding your own wedding reception could either be such a money-saver or a big expense. A backyard wedding reception could be a small gathering of close family and friends, potluck style. It could also be a DIY-project wherein the bride and the groom and their close family do the venue's set-up, decorations and catering. It can also be a full-blast formal affair with event coordinators, tents, live bands, dance floor and high-end catering and tuxedoed waiters. However, there is nothing more intimate than a small garden wedding affair set at your very own backyard. Parents are no longer obligated to pay for their daughter's wedding due to tight financial constraints, the trend is for the bride and groom to shoulder their wedding's expenses. 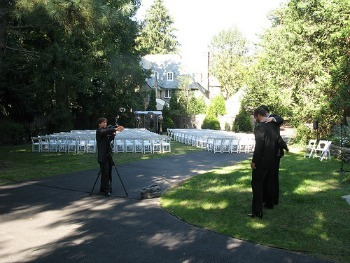 And if you are careful then a backyard wedding could be a cool, original venue that will save you money. Whether you plan on having a formal or informal backyard wedding, it is worth thinking about renting a tent. The weather is unpredictable and unless the house can fit all the guests in case the weather does not cooperate, a tent is a wise investment. 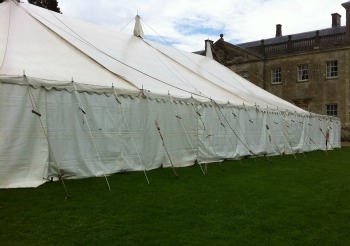 Make sure you measure your outside space carefully so that your wedding tent can fit! You can possibly save money on the flooring if you have a paved or decked backyard and then just pay for a dance floor. This works well if you are having an informal reception, but if it is more formal you will want a good floor to cope with the heels that the ladies will be wearing! It is also a good idea to attend to the garden. If the backyard reception will be at your parents' home, you could probably gouge them into shelling out a few hundred dollars to spruce up the garden. You and your future spouse could probably pitch-in and help out into turning the garden into a well-manicured lawn. If the house is yours, maybe it's time to renovate the crumbling patio pavement so guests will not trip. Maybe it's time to actually pave parts of the gravel driveway so your guests' heel shoes won't sink as they walk towards the reception area. Above everything make sure your guests are safe, especially where there are adventurous children! A fun and fairly cheap way to cover areas of your backyard that you don't want your guests seeing is to buy meters of fabric and have them attached to walls or fences. These can also be used as backdrops for your photos - a ready made outdoor studio! Match the backdrops and cloth to your theme; vintage could be 1950s curtains, a romantic classic could be white tulle with fairy lights, or match your wedding colors to your backdrop. 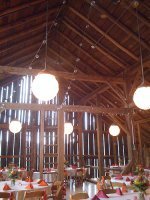 Whether your wedding is formal or informal, the lighting of the venue is important. Make use of votive candles, fairy lights, hurricane lamps, pillar candles and tapered candles in beautiful candelabras for the backyard set-up. 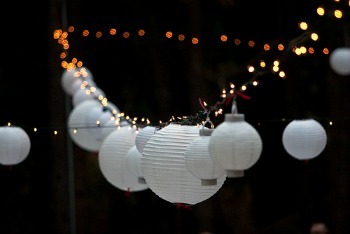 Any type of occasion can be made to look magnificent and beautiful just by putting up lights. Be practical. You cannot expect to do all aspects of the wedding even with the help of your soon-to-be spouse's effort. You need outside help in terms of serving, cooking, parking cars and the dreaded clean-up. You can't expect even your mother and soon-to-be mother-in- law to be on their knees scrubbing the floor and your father and soon-to-be father-in-law stringing lights all over the backyard and setting up chairs and tables for the guests. It is true that a backyard wedding reception saves you money on renting a venue but this does not mean that you don't need help about setting up the place. One great thing about backyard wedding reception is that you are free to decorate the place whichever way you want. You don't have a set number of hours for using the venue and guests can pretty much relax in such ambiance ensuring a great wedding reception party. In a nutshell here are some points to consider when having a backyard wedding reception. Decide whose backyard garden you will hold the reception and how large is it. How many guests will you have? Find out if the officiating minister will agree to hold the ceremony outside. Do you have a person in mind to manage the reception so that it will flow smoothly? What time of the year will the wedding be? 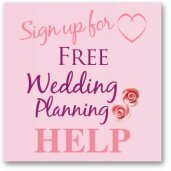 This is important so you can decide if you need more than one tent for the reception and if there is a need to rent heaters. A tent is not really mandatory but it is a great insurance in case the weather refuses to cooperate. Is there a location for a dance floor? You can always rent one if need be. Is the wedding reception informal or formal - buffet or sit-down dinner? Do you have space for the caterer's staging area? Is there enough parking space for the guests' cars? You might need to seek a permit from the local board and tell your neighbors about the coming event. Invite your neighbors if you get on well and ask if they are ok with some of the guests parking at theirs. It is also a good idea to have some helpers directing the traffic and helping your guests park. A backyard wedding reception need not be elaborate. You can choose to have a very simple ceremony with just a handful of guests for an intimate backyard wedding reception.